ON THIS DATE (July 23, 2000) ... 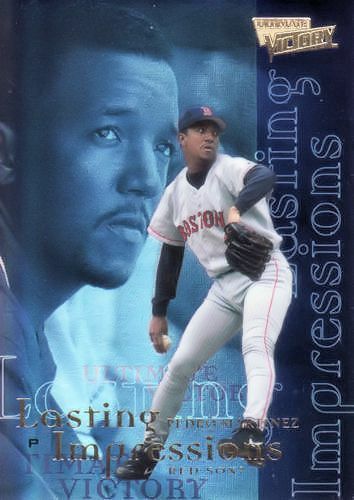 Turning a tiny hill on the Fenway diamond into a public studio, Pedro Martinez submitted his tour de force in a dazzling, 1-0 victory over the Chicago White Sox, a classic he made look almost as easy as painting by numbers. Pedro, with all but the most distracted of the 33,284 patrons on their feet, sealed the 15-strikeout performance with a virtuoso effort that crushed Chicago's last-gasp rally in the ninth. After a freak leadoff double put the tying run on second and the go-ahead run at the plate, he unleashed 95-mile-per-hour bullets to one of the most dangerous teams in baseball, Pedro mowing down the last three hitters, forcing one to pop up and striking out the other two. With his third shutout of the season, tops in the majors, Pedro (11-3) helped Boston win the three-game series against the surging White Sox and kept the Red Sox in second place in the American League East, a game behind the Yankees. Yet the outcome was in doubt until Pedro's final pitch, his 131st of the game. Chicago slugger Magglio Ordonez, hitless in his first three at-bats, started the ninth by hitting what looked like a routine grounder to Nomar Garciaparra. But the ball hit something in the infield dirt, misdirecting it past Garciaparra and sending it into left for a bizarre double. Pedro had no control over the landscaping. But he had the White Sox within his grasp, paralyzing them with his changeup until he challenged them in the ninth with his fastball. With remarkable control, Pedro did not throw three balls to a batter until the sixth inning. And other than the ninth inning, he allowed only one runner to reach second base. That occurred with one out in the second inning, when he hit Paul Konerko with a pitch and allowed a bloop single to left by Chris Singleton. But he promptly struck out Carlos Lee and Herbert Perry to end the inning. Pedro overshadowed a superb effort by Chicago's Mike Sirotka (9-8), who allowed only five hits and two walks. The only Red Sox run was unearned, made possible when Chicago shortstop Jose Valentin picked up a routine grounder by Izzy Alcantara in the fourth inning and launched it into the Red Sox dugout, allowing Alcantara to take second. The next batter, Jason Varitek, singled a 1-2 pitch up the middle to knock in Alcantara. Scoring the winning run was sweet for Alcantara, who has been vilified since his abysmal effort in Chicago. He was 1 for 3 yesterday and is hitting .391 in 23 at-bats since joining the team last month. The Red Sox had several other opportunities to score, but Ed Sprague, batting cleanup in place of the resting Carl Everett, three times hit inning-ending grounders with runners on base. Pedro, who excelled in the ninth when other pitchers might have come undone after a bad hop became a leadoff double in a 1-0 game, seized the moment instead of the moment seizing him.